This ride was well described in a letter sent to Mayor of Valleyfield. 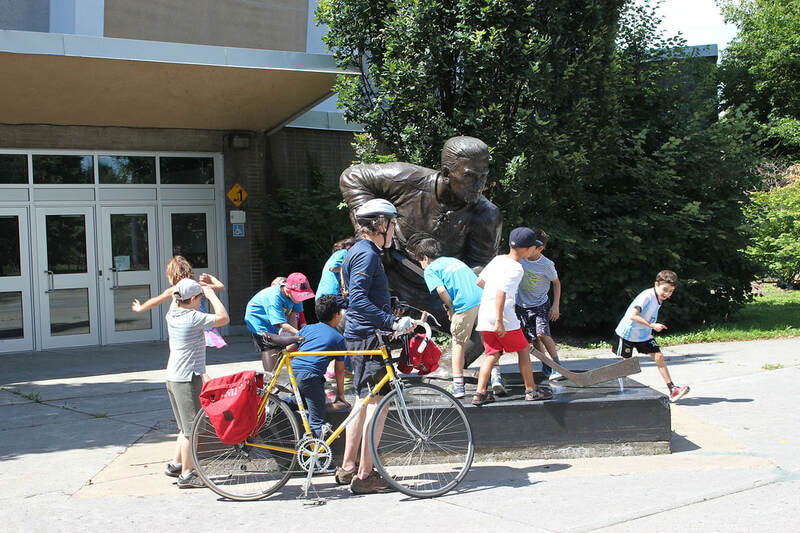 Our bicycle club, the recently re-founded Montreal Bicycle Club, has bicycle rides in and around the island of Montreal. Last Wednesday, July 5 2017, we planned to take the AMT train to Dorion and cycle to Tsiionhiakwatha/ Droulers archaeological centre. The route would be via the Soulanges Canal bicycle path to Valleyfield then continue on along the south shore to the Iroquois Village. Two unforeseen things made us shorten the ride to Valleyfield only. Normally one can cycle over the St Lawrence river to Valleyfield on a series of Hydro Quebec dams avoiding the highway 201 bridge. However due to construction work by Hydro Quebec, that route was closed. Cycling over the highway 201 bridge is possible along the small shoulder, but it is a frightening experience. Hydro should realize that closing the safe route forces cyclists to travel over a far more dangerous bridge alternative. Could they not have a flag person direct cyclists by the construction equipment rather than have them ride inches from heavy trucks going at high speed? There is also an alternative ferry crossing but that is only open on weekends. The ride through the town of Valleyfield was very pleasant. We stopped for lunch at a cafe and noted that the town should be complimented for the excellent bicycle path infrastructure they have built along the waterfronts. After Valleyfield we planned to cross the highway 132 bridge over the Beauharnois Canal to the south shore. However this bridge was constructed without any pedestrian or bicycle access. In order to continue we would have to make a long detour along the Beauharnois Canal, so we turned back at that point. It seemed unfortunate that although the town has built an excellent bicycle path network it is inaccessible to outside cyclists because of decisions made regarding the bridges. These decisions also limit the access of cyclists to the interesting archaeological centre. On the first day individual members cycled to train stations in the Town of Mount Royal and took the early morning train to Deux Montaignes. From that train station they cycled along protected cycling paths through residential areas to the edge of St Eustache. After a short stretch of a busy road they cut off to a series of country roads through farmland, the hamlet of Ste Scholastique, and horse country. They even saw a dressage course being given. Then there was a not so enjoyable stretch of busy road through St Canut to St Colomban. Crossing the Rivière du Nord they entered the Laurentians. The rest of the afternoon was a series of climbs and descents of different lengths. A brief stop was made at Camp Traramacouta as Ian had been a scout there as a lad. The cyclists had a lovely tea at Pat La Roque's home. Cycling to the end of Tramacouta Road they were pleased that Henry Nesvadba kindly picked them up for the last dirt road stretch. They had a wonderful swim, evening, and morning at Emily and Henry's country home. The second morning the MBC cycled out from Emily and Henry's country place. The descents around Lac Gustave were perilous and very rutty, One of the members even took a tumble. The rest of the dirt road sections were manageable under great control. The cyclists took the fine shoulder of the 329 down into Morin Heights, stopping at Mickey's café for a pleasant respite. It was then down into St Sauveur by the shoulder of the 364, a busy road. They crossed the town along rue Principale which has a myriad of restaurants and boutique shops all doing apparently quite well. Soon they were over the Laurentian autoroute, across the 117 and the Rivière du Nord, and at the Petit Train du Nord. After a brief pick nick stop they cycled down to St Jerome. There was rain each day. On the first day it was an hour long down pour while lunching at a fast food outlet. The second day it was rain showers as the members cycled down to St Jerome along the Petit Train du Nord. They cycled through the rain showers, rather pleasant. The energy output the second day was less than half of the first, shorter distance and mostly descents. Total distance for the fixture was approximately 110 kilometers. It was a fine ride. Meeting at Shaika café the members decided on a route plan for reaching Pointe aux Trembles. They cycled down the Glen to the Lachine Canal and thus onto Vieux Montréal. The Old Port was relatively quiet even though at the height of the tourist season. Heading up Berri they ran into fencing operations in preparation for the ill-advised E car race the coming weekend. Why the monies dedicated to this race by municipal officials could not have been directed towards the Dalle Parc, and a lasting legacy at the local and international level, is beyond reason. Vehicles still command the city over human scale considerations. After this frustration the cyclists continued on to Lafontaine Parc, stopping but briefly at Vélo Québec house. Along Rachel they proceeded until the Angus Yards redevelopment. They wondered through parts of that large project to gain a perspective on what had been accomplished, many interesting features. After passing in between the Botanical Gardens and the Olympic Stadium, they descended the escarpment on Viau, stopping this time at the impressive statue of Maurice 'the Rocket' Richard. Children from summer camps posed around the statue. Down the protected cycling path of St Clement they reached Notre Dame. There they headed eastwards. With a slight wind at their backs, they reached Parc de la Belle Rive in no time. They lunched under small trees and then went along the rest of the park which even has a small beach with bathers and a viewing platform for passing ships. Then there were long rather boring stretches of Norte Dame. Reaching Pointe aux Trembles we crossed over the bridges reaching the turnaround point of Repentigny. The return trajectory was along Gouin Boulevard and the Rivière des Prairies. We looped in and out of several stretches of new parklands, past many fine examples of early housing styles, in view of the hydroelectric dam where the waters were high and active. Another respite was enjoyed at la Maison du Meunier café at the entry to the Parc de la Visitation and the church of the same name. Its front facade was designed by John Ostell, the same architect who did the Arts Building at McGill and the Old Courthouse and the Customs House in Old Montreal. Then heading across island by Christophe Coulombe cycling path and its continuations we reached the cycling path adjoining the railroad tracks. Following that way until St Laurent we found our way to Clark, St Viateur, and then the long descent along St Urbain. Finally we reached the de Maionneuve cycling path and heading westwards Westmount and Montreal West. Total distance for the fixture was approximately 80 kilometers. The day started with clear sunny skies but by late afternoon there was cloud cover which helped to conserve energy. It was interesting long ride.